This another attempt at a sort of super-HDR look. I've done a lot more than just an HDR conversion and, of course, I did not actually have multiple versions of this image, since it included action. Once again, I'd appreciate hard-hitting critiques of the photo. How does it compare with the shot day before yesterday of the people in front of the house in suburbia. And, if you would also look at this shot, how does this one compare to both of them? http://fotoeffects.smugmug.com/gallery/8071421_D4f53#525797168_yMSHC. The shot from day before yesterday (with some changes --- straightened the columns, got rid of some wires, and made the football a bit more obvious --- that you all suggested) is here. http://fotoeffects.smugmug.com/gallery/8071421_D4f53#525796060_t4Lox. I'm considering entering one of these in the Dgrin Emulation Challenge (submit a photo in the style of a photographer that you select). The photographer I'm attempting to emulate is George Fulton, who is known for his HDR effects but is even more well known for creating images that tell a bit of a story. They often have a lot going on in them. I've entered Dgrin Challenges before and have not done well in any of them --- never made the finals. I consider them good learning experiences, though, so I keep trying. After looking through all the skate-park images, I'd say I like this one the most. It sure would be nice if we were looking at his front side though. Another thing that would make this one better is if he were separated from the background a little better. His head and upper body sort of get lost in the trees and buildings in this shot. I think it'd have much more impact if were shot from a lower angle to put most of his body against the sky for a background. 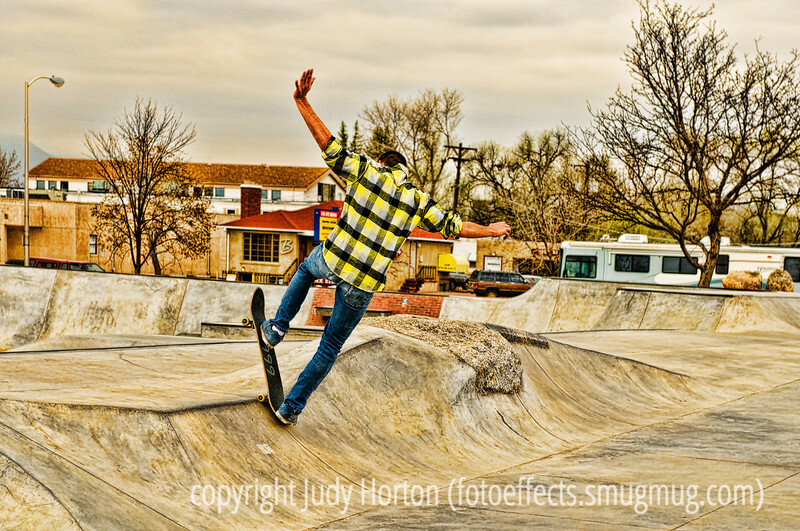 I used to ride skate parks (many years ago) and actually started my photography obsession trying to get decent photos of my friends doing crazy stuff like this. The best pics were always taken from either very low or high enough up to use the park itself as a background and eliminate any surrounding trees, buildings, and such. As for the HDR treatment, it's a little bit heavy, but I think it works with the subject fine in this case. There was something about this that was bothering me and I think I feel the same as Melissa. Otherwise I really like it. Very nice shot. I think the "2 day ago" shot is better. Cool shot, but I think I like the HDR better on the shot you did two days ago. This one looks a little overdone to my eyes. I'm going to look up the work of George Fulton, he sounds interesting. Great comp, and action, I like it a lot! Absolutely amazing and such inspiration!